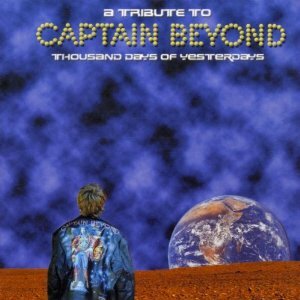 For most of us, Captain Beyond is a sort of footnote in the history of progressive rock, having achieved little apparent success or recognition for the three records they released between 1971 and 1977. But even 25 years after its release, the band’s debut album has a life of its own, and quite a few fans, at least among the rock musicians of Scandinavia. Michael Ivarsson of Record Heaven has assembled a tribute to that album, with different bands recording each of the tracks. Most of the bands represented are Swedish, plus two American, one Italian, and one German. I’m quite fond of the original album, but I’ll try to judge this tribute on its own, rather than by comparison. Musically, many of the songs are based on heavy riffs, sort of like Led Zeppelin in odd meters, and several have quieter acoustic sections with a psychedelic sound. Interestingly enough, the album consists of a number of songs that link together, mutate, and then come back in reprises or second parts, and on the tribute, sometimes these second takes on a song are done by a different band, sometimes by the same one that did the first. Highlights include Flower Kings doing “Raging River of Fear,” Five Fifteen’s title cut, “Mesmerization Eclipse” by Lotus with Brian Robertson, and Qoph’s Swedish version of that same song (one of four “bonus tracks”). But all of it is of consistent high quality, and provides good advertising for both the bands involved and for reissues of Captain Beyond’s first album.